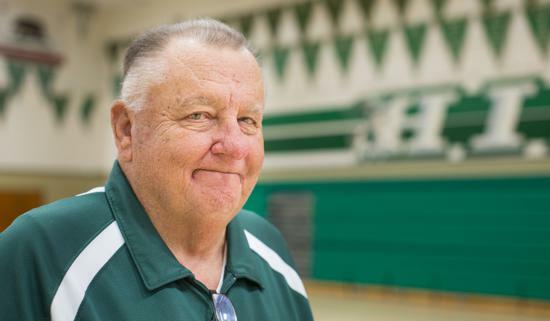 Hilltop basketball coach Ray Jindra, 73, says he’ll miss coaching, but he would like to see his grandchildren play, too. CHULA VISTA  Ray Jindra is a cancer survivor. He has one fewer kidney than normal. He admits walking up stairs is a challenge. After 52 seasons of coaching basketball — 41 as a girls coach, in which he recorded 567 wins — the 73-year-old Jindra figures it’s time to spend more time with his six children and 19 grandchildren. “I’ll miss it 100 percent but it’s time,” said Jindra, who will walk away from Hilltop after a 22-6 season but holds out the possibility of being an assistant coach somewhere. “My family is more important than anything. Not emphasizing winning at all costs is a philosophy he has carried with him since he started in the mid-'60s at Sweetwater. Subsequent stops at Mater Dei Catholic (then Marian Catholic), Southwest, El Cajon Valley and Hilltop only solidified his belief that teaching fundamentals, really listening when one of the players has a question and developing a solid feeder program through the junior high and middle schools will produce good teams. Champions? Not always. The closest Jindra came to winning a San Diego Section title was this winter when Hilltop advanced to the Division III title game at Jenny Craig Pavilion only to come up short against Mira Mesa, 56-48. Like anyone, that leaves him wishing things could have gone differently, but when he thinks back to the first Sweetwater girls team, which won only four games, he can see how far he — and girls basketball — have come. “At first coaches got into coaching the girls teams for the money, but when they found out how small the stipend was and the time it takes, they left,” Jindra said. “The biggest difference from then until now is the quality of coaching. Now there are a lot of good coaches. “A coach like (the late) Lee Trepanier at Point Loma was the exception and it showed. I think the club coaches, in general, ruin it for the high schools. They promise the world but don’t deliver. I’ve lost players (to other schools) but I never recruited a single player from another school. “Oh, the girls now are bigger and stronger, they come in with way more basic skills. It was different back when Point Loma’s Terri Mann (1983-87) played. She’d still dominate, of course. As for listening to players, it goes both ways. Breanna’s sister, senior Brittany, the player of the year in the Metro Pacific League, was asked about the age difference between Jindra and the players. Jindra said he never went more than two weeks after leaving one school before another called. Each time he’d say, “no, no’ and then after visiting, decide it might be fun after all. It started with his daughter, Didi, an All-CIF player, asking him to coach the girls at Sweetwater and ever since has been one long, fun ride.